More you spend, more you save at U.S. Champs Sports. It is possible to save up to $50 off your purchase! Final hours of a special sale event at U.S. Champs Sports online are here. Save $25 off when you spend $125 or more. Use code STOCKUP2 at checkout to receive the offer. Save $35 off when you spend $150 or more. Use code STOCKUP3 at checkout to receive the offer. Save $50 off when you spend $200 or more. Use code STOCKUP5 at checkout to receive the offer. Source of the information is Champs Sports. For more details visit U.S. 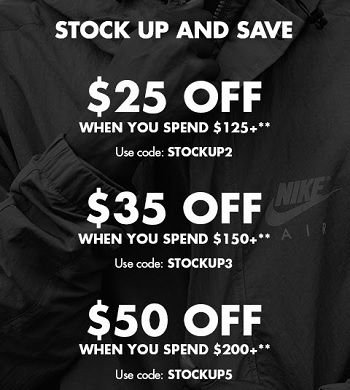 Champs Sports online.